“Quorum sensing” is an efficient communicating mechanism in bacterial world, which relies on the production and detection of secretory molecules called “autoinducers” by amongst themselves. In 1994, N-(3-oxo-dodecanoyl) homoserine lactone (3oc) was identified as the first autoinducer of Pseudomonas aeruginosa (PA). However, in the ensuing years, several studies have shown the effect of 3oc on eukaryotic cell death beyond its “quorum sensing” activity. Although many attempts were made, the underlying mechanism for 3oc induced apoptosis remains elusive. “Quorum sensing” is an efficient communicating mechanism in bacterial world, which relies on the production and detection of secretory molecules called “autoinducers” by amongst themselves. 1. In 1994, N-(3-oxo-dodecanoyl) homoserine lactone (3oc) was identified as the first autoinducer of Pseudomonas aeruginosa (PA) 2. However, in the ensuing years, several studies have shown the effect of 3oc on eukaryotic cell death beyond its “quorum sensing” activity 3,4. Although many attempts were made, the underlying mechanism for 3oc induced apoptosis remains elusive. In our study, 3oc’s pro-apoptotic effect was confirmed. In addition, we demonstrated the sufficiency and necessity of TNFR1 and caspase 8, both required in classic extrinsic apoptosis, in 3oc induced cell death. 3oc is a lipid like molecule with a 12 carbon acyl chain. 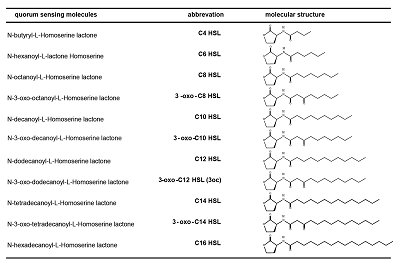 By comparing the cytotoxicity of 3oc with its analogs, we found other autoinducers in the 3oc family with similar long acyl chains also have the potential to kill, while others, like C4 HSL, do not have such activity. The length of the acyl chain are similar to those lipid in host cell membrane. Considering that TNFR1 is expressed on the cell membrane and the potential membrane targeting property of 3oc, we hypothesized that 3oc may promote the activation of TNFR1 through membrane interaction. Advanced imaging approaches facilitate our research at this stage: atomic force microscopy study revealed that 3oc could disrupt micro-domains composed of sphingomyelin and cholesterol (which mimic lipid rafts on live membrane); single particle tracking study shows that 3oc stimulation significantly alters the dynamics of TNFR1 on plasma membrane from “constraint” to “free”, which increases the probability for TNFR1 trimerization and activation. Finally, Photobleaching assay confirmed the trimerization of TNFR1 upon 3oc treatment. In a typical signaling cascade TNFR1 trimerization can lead to host cell apoptosis. In our study, we found that 3oc can use this method to kill off host immune cells, particularly neutrophils. Pseudomonas aeruginosa is an opportunistic pathogen that causes acute and chronic infections, particularly in the lung and burn wound. It is also a major cause of death in cystic fibrosis patients3. Therefore, we were interested in the physiological role of 3oc’s pro-apoptotic activity during PA infection. With the mouse model of acute PA lung infection, we compared the pathogenicity of wild type PA with 3oc deficient PA strains. It turns out that 3oc deficiency largely increases the proportion of responded neutrophils in lung tissue during infection and the CFU is significantly lower than wild type control. Besides, we also demonstrated the requirement of TNFR1 and caspase 8 in transducing 3oc’s pro-apoptotic signal and the role of those proteins in promoting PA infection. Therefore we successfully confirmed that Pseudomonas aeruginosa uses its autoinducer 3oc to activate TNFR1 and leads to Caspase 8 dependent cell death, thus facilitates its own battle to shut down host immunity. Emricasan acts as a pan-caspase inhibitor and was developed for the treatment of liver disease 5 It is the first pan-caspase inhibitor in clinical testing. Moreover, its potential applications were also investigated in other independent researches 6,7. Interestingly, we found a striking effect of Emricasan against PA infection: mouse experiments showed that the CFU load was decreased in Emricasan-treated group, with a commensurate increase of animal survival. Overall, we have unraveled the mechanism of 3oc to work as a “weapon of PA” rather than a quorum sensing autoinducer, this would help in our efforts to develop new drugs or therapies against PA infection. 1. Papenfort, K. & Bassler, B. L. Quorum sensing signal-response systems in Gram-negative bacteria. Nature reviews. Microbiology 14, 576-588, doi:10.1038/nrmicro.2016.89 (2016). 2. Pearson, J. P. et al. Structure of the autoinducer required for expression of Pseudomonas aeruginosa virulence genes. Proceedings of the National Academy of Sciences of the United States of America 91, 197-201 (1994). 3. Tateda, K. et al. The Pseudomonas aeruginosa autoinducer N-3-oxododecanoyl homoserine lactone accelerates apoptosis in macrophages and neutrophils. Infection and immunity 71, 5785-5793 (2003). 4. Shiner, E. K. et al. Pseudomonas aeruginosa autoinducer modulates host cell responses through calcium signalling. Cellular microbiology 8, 1601-1610, doi:10.1111/j.1462-5822.2006.00734.x (2006). 5. Hoglen, N. C. et al. Characterization of IDN-6556 (3-[2-(2-tert-butyl-phenylaminooxalyl)-amino]-propionylamino]-4-oxo-5-(2,3,5,6-te trafluoro-phenoxy)-pentanoic acid): a liver-targeted caspase inhibitor. The Journal of pharmacology and experimental therapeutics 309, 634-640, doi:10.1124/jpet.103.062034 (2004). 6. Brumatti, G. et al. The caspase-8 inhibitor emricasan combines with the SMAC mimetic birinapant to induce necroptosis and treat acute myeloid leukemia. Science translational medicine 8, 339ra369, doi:10.1126/scitranslmed.aad3099 (2016). 7. Xu, M. et al. Identification of small-molecule inhibitors of Zika virus infection and induced neural cell death via a drug repurposing screen. Nature medicine 22, 1101-1107, doi:10.1038/nm.4184 (2016).